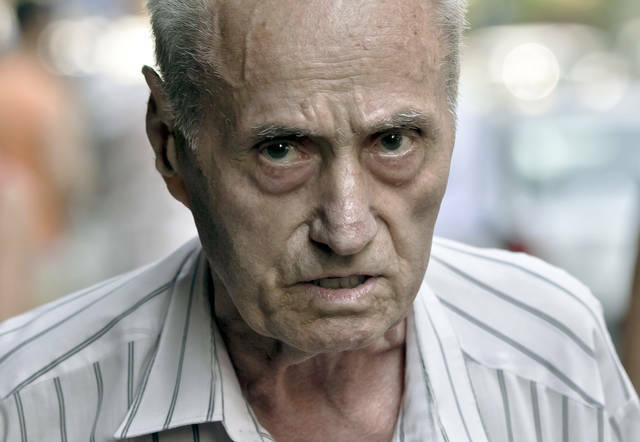 FILE - This Tuesday July 30, 2013 file photo shows retired Lt. Col. Alexandru Visinescu, 87, former commander of the Ramnicu Sarat prison from 1956 to 1963, looks at journalists as he enters his home in Bucharest, Romania. Romanian authorities say Alexandru Visinescu, a communist-era prison guard serving a 20-year sentence for crimes against humanity, has died in prison at 93 on Monday. BUCHAREST, Romania (AP) — Alexandru Visinescu, a Romanian communist-era prison guard serving a 20-year sentence for crimes against humanity, died Monday in prison at 93, Romanian authorities said. Visinescu was the first prison guard from the early years of communism to go on trial in Romania. He became a national symbol of the Communist era’s brutality against its own people, most of whom who had simply fallen afoul of the regime. Romania had about 500,000 political prisoners under the Communist regime that was in power from 1947 until 1989, about one-fifth of whom died while in detention, according to historians. Visinescu died Monday at Rahova prison hospital, Bianca Filote, a spokeswoman for the Institute for Investigating the Crimes of Communism, told The Associated Press. “He will forever be known as the torturer adopted by the communist Securitate secret police to kill. He ended the lives of defenseless human beings, physically and mentally,” Andrei Muraru, who initiated the investigation into Visinescu’s conduct in 2013, told the AP. Visinescu was convicted in 2015 for the abuse and killing of prisoners at Ramnicu Sarat prison in eastern Romania, where he was in command from 1956 to 1963. He was imprisoned in February 2016 after losing his appeal. Former prisoners under Visinescu testified that they were denied access to medical treatment, heating, exercise and adequate food. They were held in solitary confinement and beatings were common. The prison housed members of Romania’s intellectual, political and military elite. “He annihilated his victims in a sadistic program of physical and mental alienation, total isolation combined with physical torture,” said Muraru. During his trial, Visinescu showed no remorse and insisted he was only following orders. A judge and prosecutor asked him six times why inmates died under his command. He answered just once, suggesting they died of old age. His lawyer, Camelia Niculescu, said Romania’s current authorities wanted her client to die in prison.